Danganronpa Another Episode: Ultra Despair Girls released today September 1 on the PlayStation®Vita as both a physical and digital release. 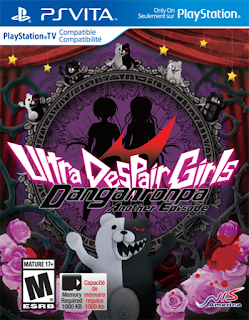 Danganronpa Another Episode: Ultra Despair Girls, is unpronounceable if spoken aloud at a high speed. I liked the game, but it suffers from some bad parts. The game is good looking, fully animated with CG animated parts. The long worded titled has long worded and well thought out writing, filled with moments of big laughs, not just some stupid fart jokes. Audio and music are still on par with the previous games which have all been good so far. The girls in the game talk so much and ignore me I might as well have a wife. In this iteration you play as Komaru Naegi, she's trying to survive as Monokuma robots are killing people. She gets equpied with a megaphone gun that shoots truth bullets. The bullets she earsn don't just destroy the can open doors or command enemies. You also get equppied with Toko Fukawa who can switch to a homicidal maniac "Genocidal Jill." You can switch to her for certain special over the top attacks. The game is using gameplay elements so old I think it might be from before many millennials were born! Movement is like taking home my non-existent wife home after a heavy night of drinking. The in-game camera for the game looks like it went out with my non-existent wife and I for that night of drinking. The gun used in the game is very hard to take out enemies, da bears. It's easier to switch to Jill. It's awkward to switch between the different bullets I can use and pick one that can take out "da bears." It's hard to aim the weapon and it takes a long time to line up the shot. I get balancing between the two girls, still it would just be so much simpler to have chosen one style over the other. Me give Danganronpa Another Episode: Ultra Despair Girls 7/10, me would give game less points for bad gameplay but tiny people make want to play more. It's acceptable for the Vita and I really wanted to like it a lot more with the ideas and its art style.